Oh my goodness, you guys. Today is THE day. 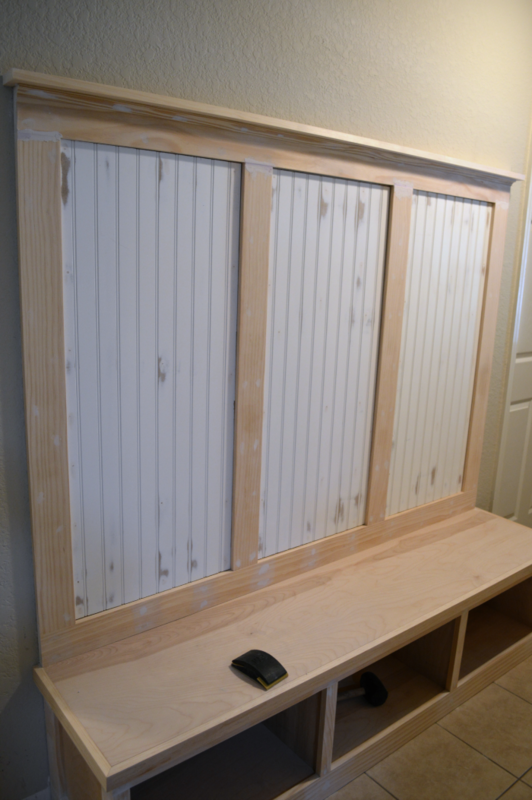 I am finally sharing my entryway mudroom tutorial! I have had so many requests to share this and I apologize that it’s taken me this long. I temporarily lost the photos that I took of the building process, but after some sleuthing around in the far reaches of my old computer files, I finally found the folder that they were in. #techproblems Anyway, there is A LOT to cover so I am going to go ahead and just get started. I will list sources at the very end, so be sure to check that out! Take a look at the entryway in it’s sad former existence. Like I said in the mudroom reveal, I have been fawning over mudrooms since I first discovered Pinterest four-ish (or more) years ago. I was stuck in an apartment and dreamed about the day I would finally own a home and be able to have my very own mudroom. Well, of course as almost all first time home buying stories go, finances dictated how much home and character we could buy and none of the homes we were considering came with a mudroom. Never fear though! It was nothing my DIY loving heart couldn’t tackle. 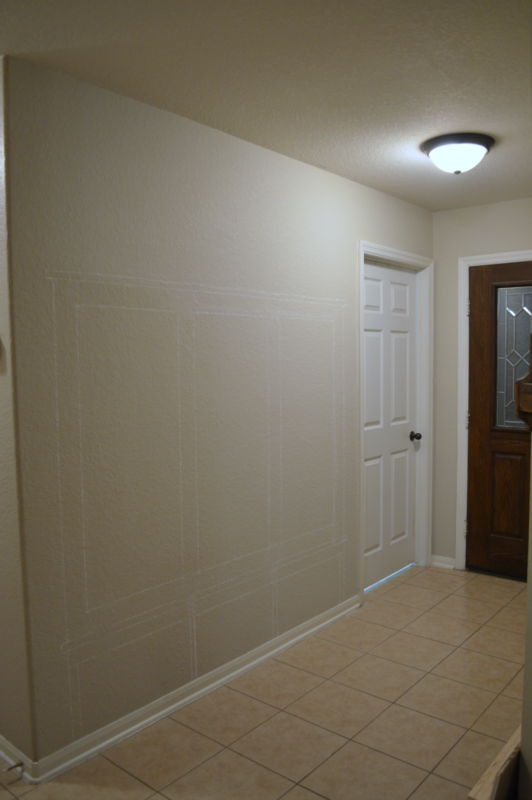 In the photo below I had traced an outline with chalk for what I was envisioning in my head of what I wanted the space to look like. 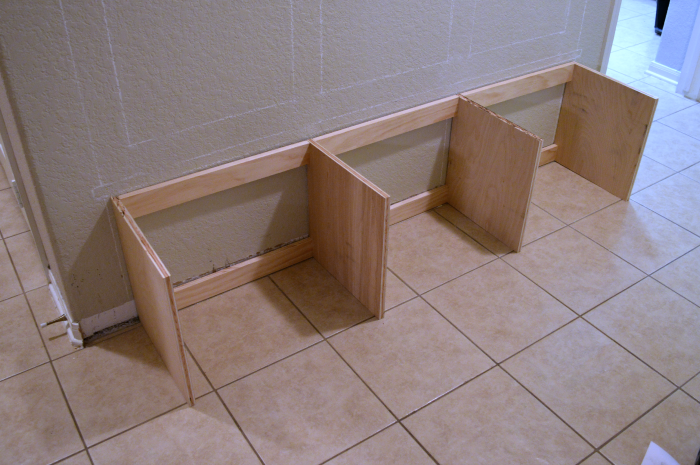 First we ripped off the baseboards so that the bench would sit flush up against the wall once we installed it. Then we started on building the bench base. 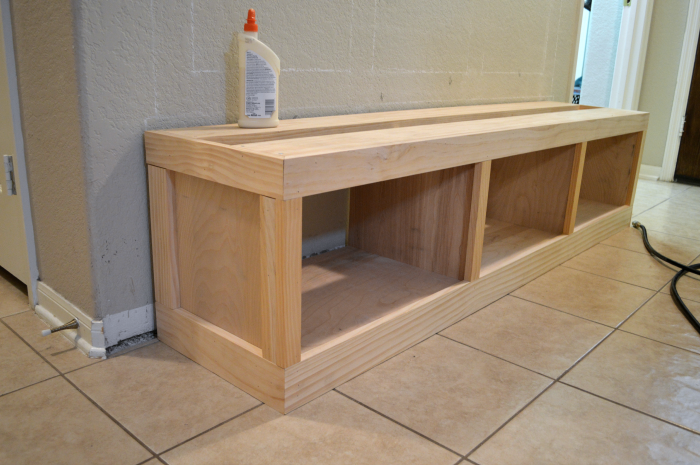 We used some leftover 1/2″ thick plywood from the Printmaker’s TV Console for the cubby dividers and some 1×4 boards to connect them together and to act as cleats to nail the bench to the wall. This post contains affiliate links for your convenience. Click here to read my full disclosure policy. Everything was connected using 1″ pocket hole screws. We made sure to make the holes face towards the wall so that they would be hidden when everything was assembled. Here’s a look at the base pushed against the wall in place. Before attaching the base to the wall we needed to add the shelves that act as the bottoms of the cubbies. They are attached 3 inches up from the ground using pocket hole screws. In the picture below the base is turned on its side with the front facing upwards. Next we turned the base upright and added support for the bench seat. 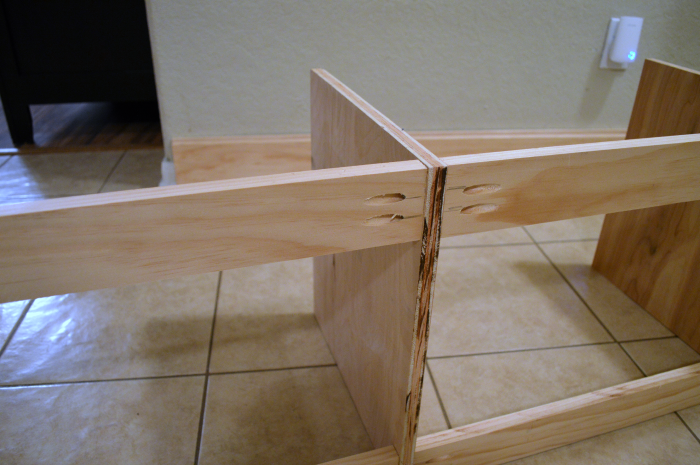 The supports were made by screwing some spare 1×6 boards into the tops of the cubby dividers. You could use a full sheet of plywood if you want. We just wanted to use up what we had on hand and avoid spending more money. Can you see a theme here? 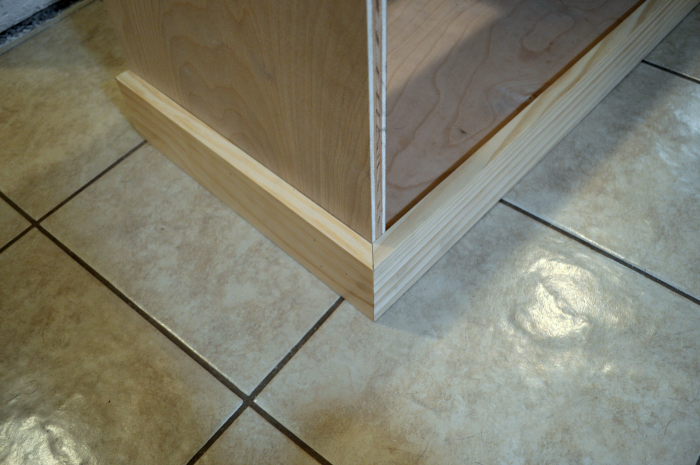 To cover up the open area below the cubby shelf bottoms, we nailed in some base trim in the form of 1×4 boards. I didn’t want to use the same baseboard as what we have around the house but I wanted the height to match, so this worked out well for that. At this point we realized that we had sort of messed up and wouldn’t be able to secure the bench to the wall with the top and bottom base cleats, since we had just covered up any form of access to the bottom cleat when we nailed on the base trim. #fail We figured that all was ok, though, and that securing it by the top cleat would be sufficient enough to keep the whole thing in place. We were right! 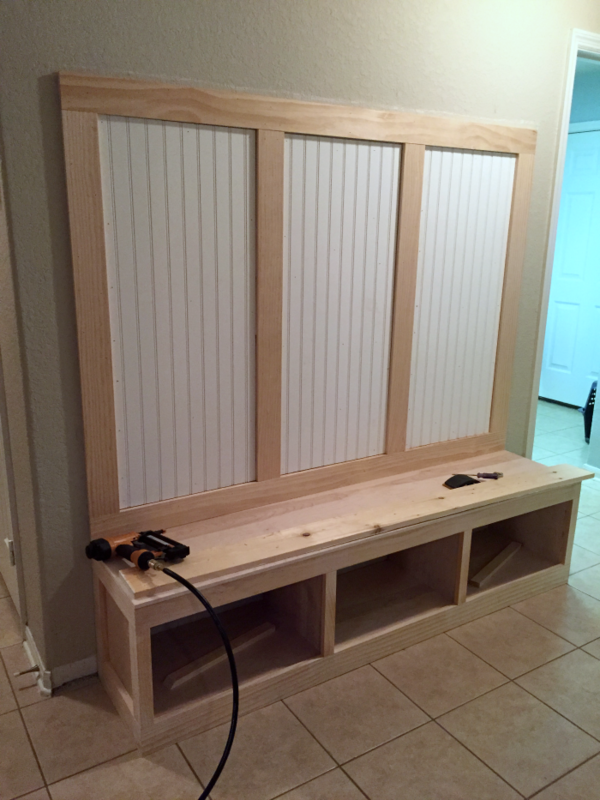 The bench was secured to the studs in the wall using long screws. I think they were 3 or 4 inches long- long enough to go through the cleat, drywall and into the stud. That bench is going nowhere! We tugged and nudged it to see if there was any wiggle and it was solid. Success! 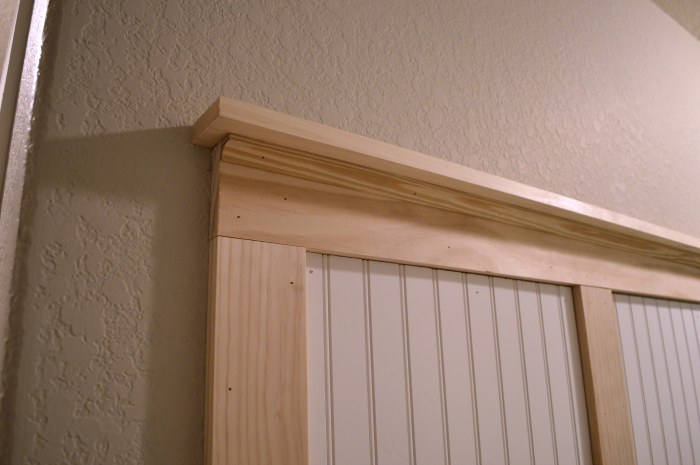 After it was secured to the wall, trim was attached to the sides and front with wood glue and nailed in with a nail gun. The top trim pieces are a 1×3 boards. We trimmed out the front of the dividers with 1x2s. 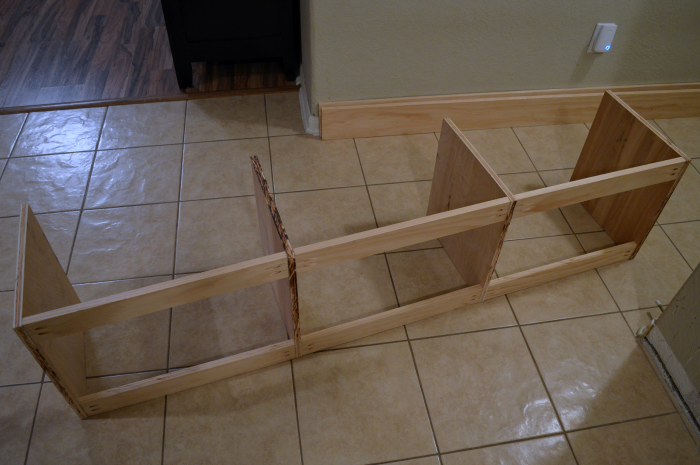 The sides of the bench were a little bit trickier since one side had the side of the front 1×2 to account for. In the picture below you can see that we used a 1×3 for the trim piece next to the wall and then we used a 1×2 for the other side, butted up against the front 1×2. Make sense? 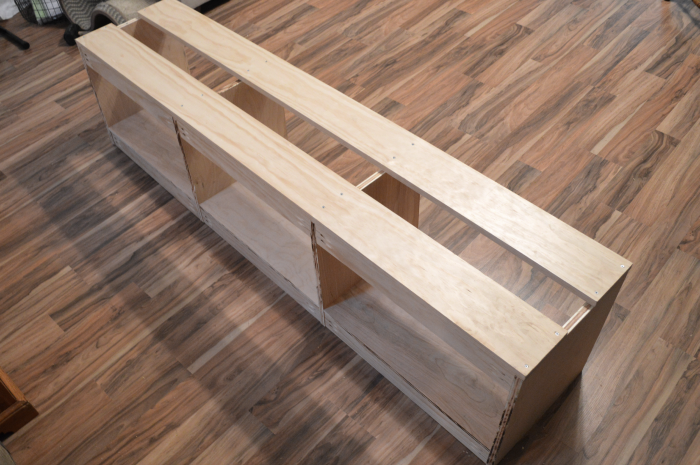 For the bench top, we used a piece of 1/2″ plywood and screwed it in from the underside of the bench seat supports. The plywood was cut flush to the dimensions of the bench base. Ours ended up being 16.5 inches deep and 72 inches long. One of my favorite parts of this whole piece is the board and batten with the beadboard paneling. So pretty! First we nailed and glued (Liquid Nails) the board and batten frame on the wall. The boards are 1x4s. We nailed and glued the beadboard panels in between the boards. To cap off the top of the board and batten, we used a 1×3 and some cove moulding to add a little detail. The board overhangs by about 3/4 inch on each side. Our unit ended up being approximately 70 inches tall after the board and batten plus trim was added. After all of that nailing, there were about 5 million holes and a few seams between the boards. I had the fun task of filling and sanding each and every last hole and caulking the seams. This is my least favorite part about DIYing. It’s so unbearably tedious. Elmer’s color changing wood putty is my absolute favorite wood filler. It goes on pink and turns white when it’s ready to sand. You can also see that we trimmed out the bench seat with 1×2 boards to create a bit of overhang on the seat. The corners were mitered and the boards were nailed in with the nail gun. Next was the almost equally crappy task of painting the bench seat base. Those cubbies are a pain in the neck (literally) to paint inside of. Definitely grab a pillow or towel to sit on while you’re down there on the floor for the hour it takes to get the job done. 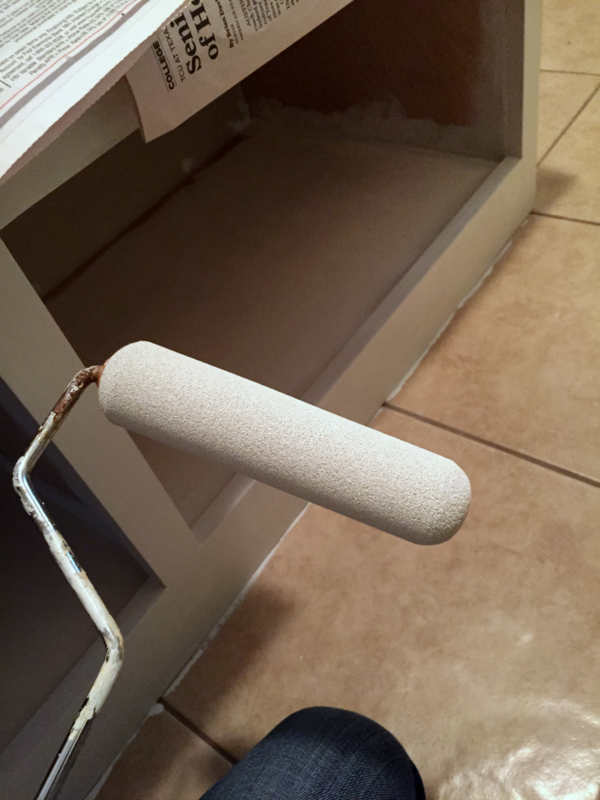 I used a 6 inch foam roller and my favorite shade of Sherwin Williams white paint- Alabaster. I didn’t worry about getting paint on the floor because I knew that I’d be adding quarter round to the base board and it would cover it up. After the paint was dry, I taped off the board and batten so that I could apply my stain to the bench seat. I used Minwax Provincial for my stain. And I also forgot to photograph the stain after it was applied. 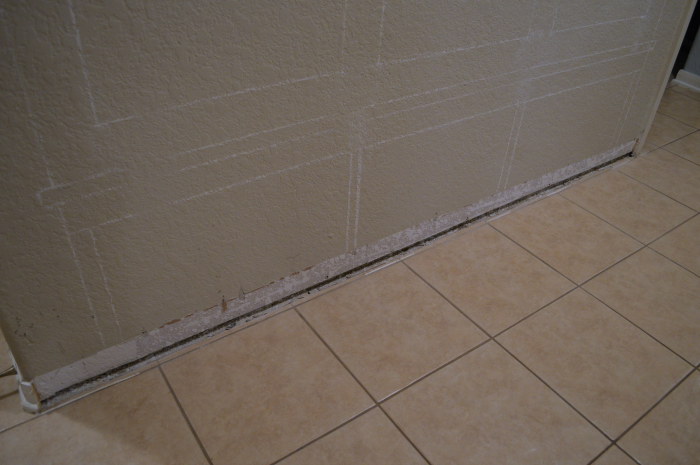 #oops You can see the quarter round that was added to the baseboard in the photo below. After everything was dried and cured, the last step was to add the hooks and accessories. I changed my mind about 4 times on which hooks to use. 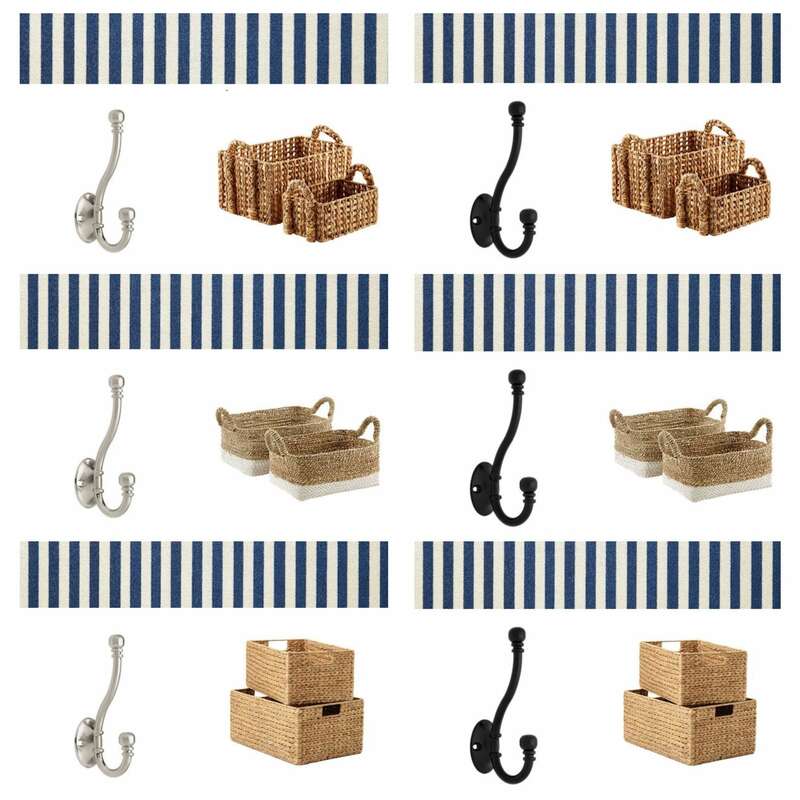 I already knew which rug I wanted but I couldn’t decide on the hook finish or which baskets. I put a call out to my friends on social media to get some help for my indecisiveness. I am so happy with the finished product. It was quite an experience to build but it’s so gorgeous and adds so much needed storage. This project cost us about $250 to complete, and that’s including the baskets! Well worth it, I believe. 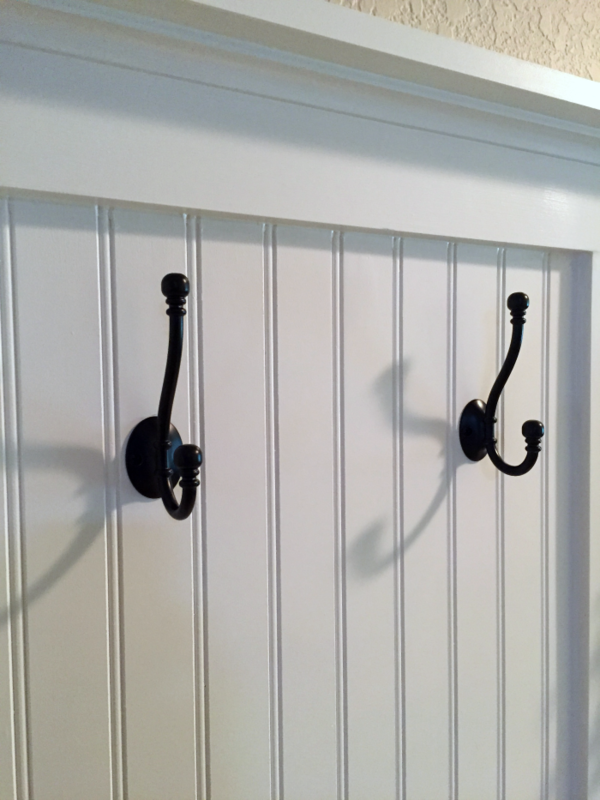 For more photos of the finished mudroom check out the entry mudroom reveal post! AND CHECK OUT EVEN MORE >> DIY HOME DECOR PROJECTS. Oh. Em. Gee!!! This is absolutely incredible Sarah!!! I’ve been dying for a beautiful bench just like this one for years and no I know just how I’ll build it! It’s perfect my friend! Oh man! So glad you were able to recover the photos! 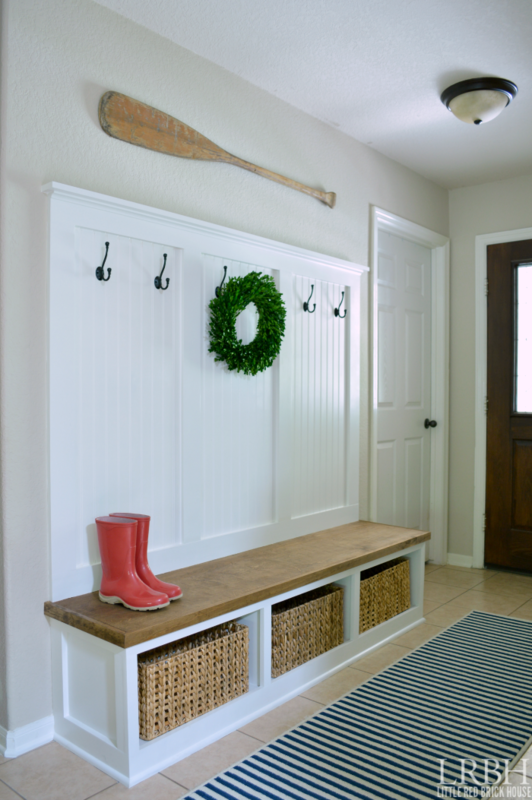 Your mudroom is SO beautiful you really did a great job! Thank you so much, Corinna! It was definitely a relief, LOL. I love your entryway and have been swooning over your bench as soon as I saw it! Thanks for the tutorial! Oh how I wish a I had a large enough entryway to create my own! Thank you, Jenny! You are too sweet! Hi Sarah- love this! It is beautiful This is exactly what I’d love to do in my mud room. Out of curiously, can you share the overall dimensions (height of unit, height of bench, length of unit and depth of bench from the wall)? I’ll customize mine to fit my space but would be interested to compare. Thanks! Can’t wait to see what you make next. Hi Ali! Thank you so much. I would love to share the dimensions with you. Thanks for asking! The total unit length is 72 inches and the total height is 69.5 inches. The bench height is 18 inches and the bench depth is 16 inches. This looks awesome and i will be making something similar for my house this weekend. Can you tell me what size nails you used? Brad nails? Secondly, which wood type did you use. Thank you, Clayton! We used 1 1/4 inch nails with our brad nailer. The wood was the premium 1/2 inch pine plywood and different sized pine boards from The Home Depot. I’d love to see it when you’re all done. Feel free to shoot me an email when you’re finished, if you’d like. Happy building! One more quick question. What were the dimensions of your square dividers? The divider dimensions are 15 inches wide by 13.5 inches tall. Hope that helps! Sarah, this is amazing! I love love love mud rooms and this bench is completely on point! I love the combo of board and batten on the back. Everything works so well together and I can’t wait to get our mud room fitted out with an awesome bench like this. Thanks for sharing! Thank you so much, Shonee! We are still loving it! Probably the best improvement we’ve made to the house so far. I can’t wait to see what you do with yours. I know it will be gorgeous! I adore this! I have looked at many and this is what I will replicate. Thank you. Can you tell me which size of the hyacinth bins you used? thanks again! Thank you so much, JoAnne! That is such a compliment! I used the large sized bins. The dimensions from the site state that they are 17-1/4″ x 11-3/4″ x 8″ h. Hope that helps!! Oh my goodness, you are right! How did I manage to grab the dimensions from the wrong basket? I apologize. The baskets I have are the Large Open-Weave Water Hyacinth Bins. And the correct dimensions are 12-1/2″ x 19-1/2″ x 12″ h. Sorry to confuse! And you are not bugging me at all. If you have any questions you are absolutely welcome to ask as much as you need. 🙂 And good luck on the project! I would love to see it when you’re finished. I am a little confused by your dimensions you listed. 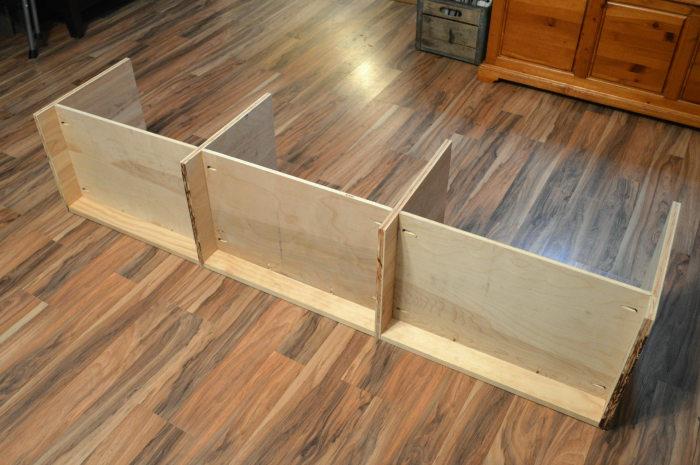 If your divider length is 15” wide how would you fit a 19 1/2 inch wide basket in there? Going to do something similar for my mudroom entrance, thanks for your inspiration. Hi Cody! When I say “divider” I’m talking about the board that is in between the cubbies. So each one, from front to back, is 15 inches wide. And from top to bottom they are 13.5 inches tall. Hope that helps! The space between each divider, where the baskets sit, is about 22 inches wide, so the baskets have a little bit of room on each side. Hope that helps, and thank you so much for following along with the blog! Looks great! How did you hang the oar? I have a similar oar in my hoard but have been puzzled as how to best hang it up! Thank you, Jen! I screwed two D-rings into the back of the oar and then hung them from the wall with screws. Hope that helps! 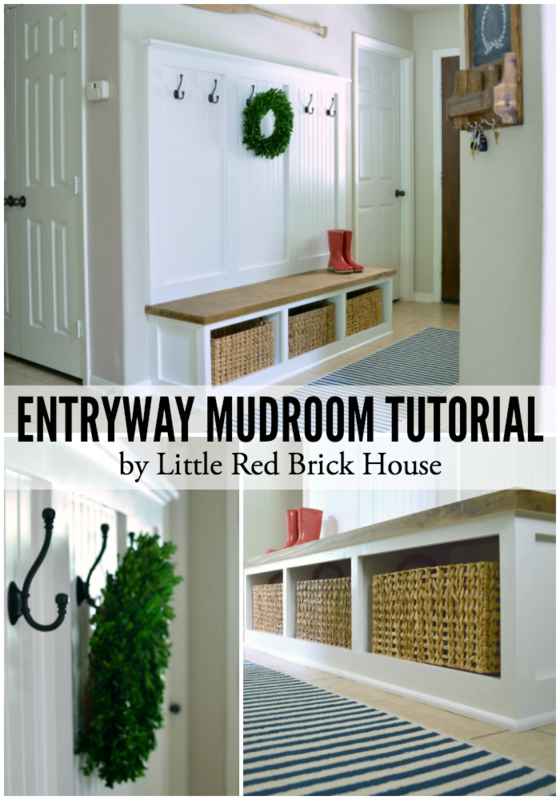 I have been looking for something to do with our very big and empty entryway and I LOVE this!! Thank you so much, Marjan! Including the hooks and baskets, it cost a little less than $250 to build. You could save even money by purchasing less expensive baskets and by buying the cheaper quality boards instead of the premium. Thanks so much for stopping by! So amazing!! Can you share how much this project costs about?? Thank you!! Hi Lindsey! Thank you so much! 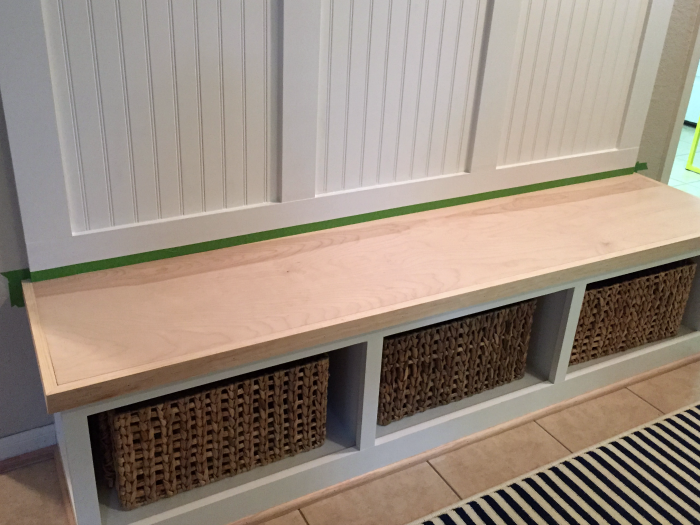 It cost us about $250, including the hooks and baskets, to complete the mudroom bench. Your tutorial is thorough… thank you! I was scratching my head as to how you attached the upright pieces of the cubby to the rear braces… pocket screws! Of course! I have been dying to add a pretty mudroom space to our back room, which happens to double as our formal dining room in our 147 year old house. Ah the joys of an old home… Anyhow, thanks again. I can totally do this in mudroom but need my hubby’s assistance…let’s hope 2017 will make it happen!! I can totally do this but I need my hubby’s assistance. Let’s hope 2017 will make this happen. Hello, just curious, what was the thickness of the wood you used for the shelves that act as the bottoms of the cubbies? Hi, Christina! 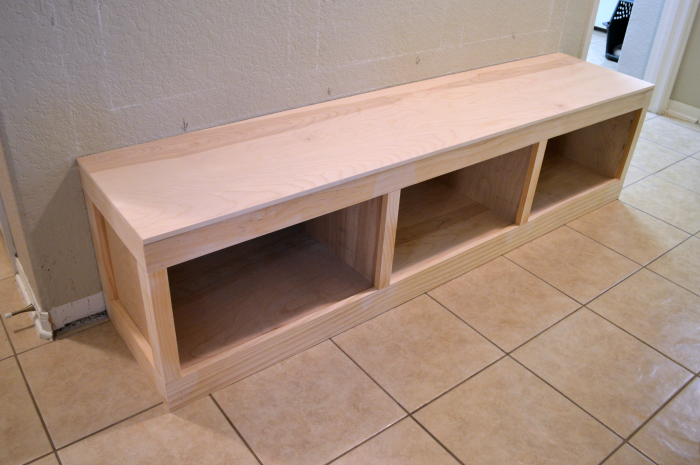 We used 1/2″ thick plywood for the sides and bottom shelves of the cubbies. Thanks for the write up. Coming along nicely so far. So glad to hear it, Jeff! I’d love to see it when you’re finished! It looks gorgeous, David! It fits the space perfectly and those baskets are lovely! Thank you so much for sharing! Hi David! Could you possibly share your measurements (h w d) with me? We too have a smaller space and I’m curious as to what yours were. Thanks! I know you posted this a couple years ago, but I am doing my own custom build using some of your methods, and I’m curious what type and size of screws you used to screw in the 1×6 for support for the bench? I know you used 1” pocket screws for the rest and then the nails for the trim. This is my first big woodworking project!